Australian researchers have offered a glimpse of a future that could see viticulturalists do much of their work remotely, thanks to three new pieces of technology. The first system put forward by the team from the University of Adelaide is an iPhone app that allows producers to measure canopy growth. The device is currently undergoing further tests by a “leading wine company” prior to its planned release via iTunes. 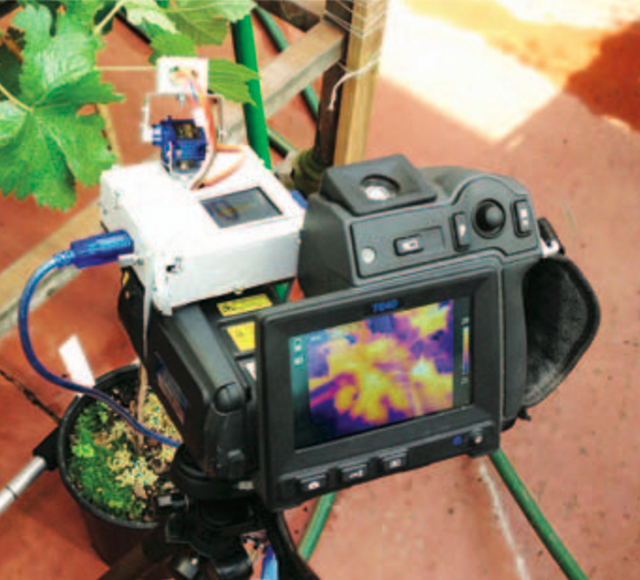 The second innovation is a camera that uses near-infrared spectroscopy – wave lengths imperceptible to the human eye – to see how much water stress a vine is under. The cost of this system is expected to be 1% of a thermal camera currently being trialled. Finally, the team has devised a machine that attaches via electrodes to the berry and uses impedance spectroscopy to measure grape quality. The technology works in a similar way to systems used to gauge fat levels in humans, passing an alternating current through the berry to give a picture of how cells are behaving. “Are they leaky or degraded? How much sugar does the berry contain. All this can be worked out from a single measurement,” outlined Tyerman. All three of these new systems, together with others in the pipeline, have been developed with the help of the team’s “vineyard of the future”, a one hectare vineyard on the university’s campus that is kitted out with state-of-the-art sensors and image analysis equipment. Painting a picture of the potential future for viticulturalists, he suggested: “Ultimately you could have a control system in front of you, with the vineyard wherever it is, and you could see what’s going on, what needs to be done in terms of spray regimes or whatever, from the sensors and the imaging that you’ve got at your fingertips. I’m in the PNW United States, eastern Oregon and Washington. I have a great interest for my company to be involved in bringing these systems to our region. We are in need of growth in this direction and see very little from our research institute’s. An amazing tool! Not only would it allow precision viticulture to attain new heights, it would also allow vineyard managers a greater awareness of vine physiology. The potential for remote management is there, but it also provides more intimate knowledge of the vines that are being managed.